AT&T has announced a new 3G LaptopConnect device by Sierra Wireless – the AT&T USBConnect Lightning. The new 3G modem is set to be officially available throughout the carrier’s retail stores beginning November 22nd. It will be available at no cost after a $100 mail-in rebate with a DataConnect Plan of at least $35 a month. Pay $99.99 after two year agreement and receive a $100 AT&T Promotion Card. 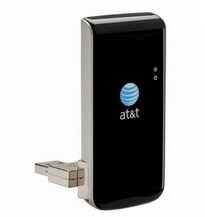 AT&T USBConnect Lightning is compatible with AT&T’s upgraded HSPA network, providing users with download speeds of up to 7.2 Mbps. The device comes pre-loaded with AT&T Communication Manager (ACM) 7.0 software to help customers manage their connections. As for AT&T’s HSPA 7.2 Mbps network upgrade plans, AT&T plans for initial deployment of HSPA 7.2 in Charlotte, Chicago, Dallas, Houston, Los Angeles and Miami by the end of the year. The company plans to deploy HSPA 7.2 in 25 of the nation’s 30 largest markets by the end of the second quarter of 2010, and to reach about 90 percent of its existing 3G network footprint with HSPA 7.2 by the end of 2011. 0 comments on "AT&T USBConnect Lightning announced - it's a 3G LaptopConnect device bySierra Wireless"